Boston Mayor Marty Walsh spoke during an interview with reporter Joshua Miller during the Boston Globe&apos;s Political Happy Hour at Suffolk University. A vocal group of parents is challenging Mayor Martin J. Walsh’s education agenda, saying he wants to torpedo the city’s public school system in favor of a semiprivatized arrangement dominated by charter schools and funded by out-of-state billionaires — a charge Walsh denies. The complaints focus in large part on Walsh’s proposal to combine enrollment lotteries for district and charter schools into a single application process. At seven public meetings across the city this fall and in widely shared social media posts, the parents have assailed the plan as a Trojan horse for charter school expansion. Many of them belong to a group called Quality Education for Every Student, or QUEST. The sometimes-contentious meetings were organized by the Boston Compact, an organization created in 2011 to foster collaboration among district and charter schools and that now promotes the enrollment plan. Critics believe the compact, funded in part by the procharter Bill & Melinda Gates Foundation, will promote charter expansion at the expense of traditional district schools. The conflict escalated this week when QUEST asserted that Walsh, during a meeting with some of its members on Sept. 29, “revealed plans to shrink the number of Boston Public School buildings to 90.” Boston currently has about 125 school buildings. Walsh said that he met with parents on that date, but denied discussing closures. “There was absolutely no talk about shrinking schools or closing schools — none at all,” he said in an interview. Walsh supports charter schools, but rebuts allegations that he wants to see a rapid expansion of the independent, publicly funded schools, pointing to his October testimony before state lawmakers calling for a gradual lift of the state’s limit on charters. He said he hears every day from parents who are excited about the enrollment plan, which supporters say would streamline the sometimes cumbersome enrollment process. Public opposition, he said, would not stop it. 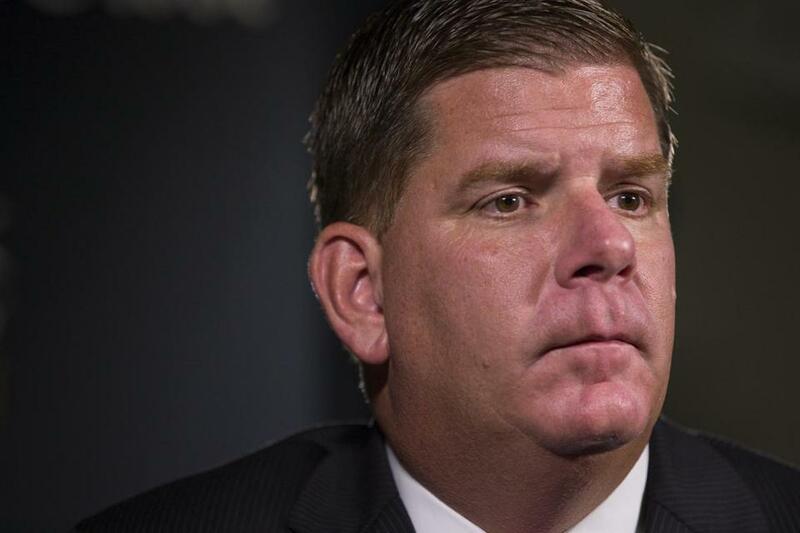 Walsh’s critics have said his approach to enrollment mirrors his support of the controversial Olympic bid. “Behind closed doors, decisions are made, and then all of a sudden . . . the doors fling open, and it’s like, ‘OK, this is what we’re going to do!’ ” said Lerner, who has distributed bumper stickers comparing the Boston Compact to the Olympic proposal. Unlike the Olympics, there are no polls to gauge public opinion on the enrollment plan. But most parents at a public meeting in Allston last month said they saw no reason to change the current system, in which families apply separately to charter and district schools. Rachel Weinstein, chief collaboration officer for the compact, denied that it is working to expand charter schools. Parents who attended other meetings on the enrollment proposal in neighborhoods across the city described widespread skepticism about the plan and frustration that many decisions appeared to be made behind closed doors, irrespective of parent views. At the most well-attended meeting, in Jamaica Plain, parents also expressed concerns that charter schools are not prepared to offer a full range of services to students with special needs, according to a parent blogger who attended. Charter schools deny the assertion. Some parents say they like that the current enrollment system allows them to apply separately to charter and district schools, potentially winning seats in several lotteries and then choosing the best fit. Walsh’s chief of education, Rahn Dorsey, said the goal of unifying enrollment is to end a system in which some parents have multiple options while others lack the time or information to access them, so that all families have an equal shot at a good school. Dorsey, who serves on the compact’s steering committee, also refuted parents’ assertions that a July compact agenda obtained through a public records request showed the city’s intention to turn district school buildings over to charters. “I’ve never been in any discussion with anybody about co-location ideas,” he said. Walsh said unified enrollment is among a series of planned reforms — including high school modernization, universal preschool, and curriculum changes planned by Superintendent Tommy Chang — that will permanently alter the city’s educational landscape. He called for unity around shared concerns about what is best for the city’s children.